In 2010, a new hair formulation – QR 678 – was invented by Dr. Debraj Shome and Dr. Rinky Kapoor, while working on a sudden spurt of cases of abnormal hair loss. The doctor duo worked on 10,000 patients including 100 chemotherapy patients between 2010 and 2017, before getting a patent from the United Stated Patent and Trademark Office (USPTO), for their hair growth factor formulation in June 2017. The doctors have now applied for DGCA approvals for commercial production of QR678 for its widespread use through a network of hospitals and certified clinic chains across India. Traditional transplants essentially trans-locate hair from the back of the head to the affected area, but again ill-perform on the re-growth needs of the patient. QR678 is essentially a potent mixture of hair growth factors or proteins, which are already present in the human scalp and which are responsible for hair growth. With the help of microinjections into the scalp skin, this QR 678 Formulation helps the hair to grow back. The hair that grows back by the treatment with QR678 looks natural, as the dormant or dead hair follicles are stimulated to grow hair again. QR678 is a product of hard work and years of research by Dr. Debraj Shome, a facial plastic surgeon located in Mumbai & a honorable lifetime member of the AIOS. Breach Candy Hospital; Saifee Hospital; Apollo Spectra Hospital; S L Raheja Fortis Hospital; Mumbai, India. 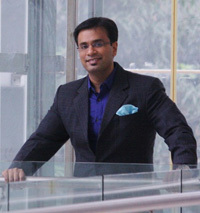 Director, The Esthetic Clinics, India.